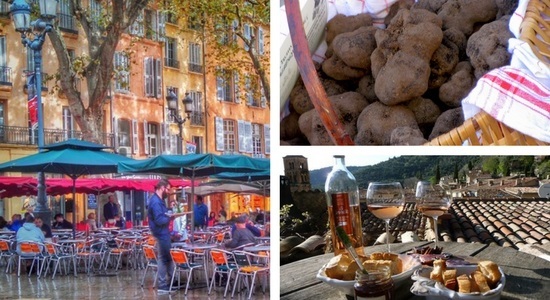 Provence in January – it must be truffle time! Christmas is over, New Year’s Eve has been and gone but the best is still to come! In January, you can join a fabulous and unique tour of Provence. One where authenticity and gourmet delicacies come together to warm the chill of winter – because January in Provence means truffle time! Provence is home to the Tuber Melanosporum, commonly referred to as the black truffle, or even as the “black diamond”. The black truffle season starts in November but the potent aromas don’t completely mature until January. Taking a gourmet trip to the South of France in January is a must for any foodie and Your Private Provence has put together, for the third season, a luxury gourmet Provence tour to highlight the aroma and culture of the truffle. This luxury winter tour is an opportunity to experience authentic, real Provence. You won’t see many tourists and you will partake in the lifestyle like a true Provencal yourself. Imagine sitting outside the local café on market day eating oysters and drinking Picpoul de Pinet at 11 am alongside the locals. You’ll go truffle hunting in the backwoods of the gorgeous Luberon. Experience a lip-smacking truffle lunch prepared especially for you at a Provencal farm house tucked away in this little corner of paradise. Along with the truffle countryside and the scenic backroads to get there, you’ll also explore three of Provence’s most beautiful and historic cities: gorgeous Avignon, stunning Aix-en-Provence and captivating Cassis. Winter in Provence has so much to offer and only a savvy few seize the opportunity to see it without the razzmatazz and crowds of the tourist season. This is genuine Provence, a land of wonderful wines, fabulous produce and of course those tempting, tasty truffles. And there’s nothing better than enjoying this heavenly little corner of France all to yourself. Take advantage of the cheaper airfare and come explore more of Provence than just the summer tourist attractions. There’s another side of Provence that will capture your soul, come and find it in January – cultural immersion is guaranteed on this tour.